Mirrors are something that people merely want to look into! Generally, each house has mirrors in their bedrooms, dressing rooms, bathrooms or toilets. Mirrors have variety of uses such as reflecting light, enhancing decor & open-up space! No matter where you use the mirrors; but after knowing these mirror decor ideas it will definitely inspire you to decorate for your home interiors! Mirrors are standard fixtures in bathrooms and changing areas of the home! But mirrors also serve as functional pieces in other rooms, allowing a chance to express personal style by adding remarkable flair, visual interest and the illusion of added space to a room. When it comes to decorate home with mirrors, it simple maximize both the fashion and function of a mirror! Some of them have mirrors that are carefully selected to stand out as decor pieces in the rooms where they can be showcased. However, many people don’t really understand how to make the use of mirrors as a part of home décor! There are many ways to use them in your home like decorative mirrors, vanity mirrors, mirror art, etc. Therefore, mirrors can play a vital role in making your home more beautiful and harmonious for day to day life! From the home decor point of view, mirrors can be used in every single room. For example, they can be used in pieces and work of art as they usually reflect light and create new dimensions to space! To choose a wall mirror for your home interior, one has to look for its size, shape, style of the particular mirror with respect to its use and placement! Check out these creative mirror decor ideas to rejuvenate your home interiors without spending much on it!!! Also Read: Best Corner furniture & Decoration Ideas for Your Home! The bathroom is one of the most obvious place to hang a mirror! It can be tricky to decorate the bathroom, so it can be wise to start with your bathroom mirrors! If you are looking to make a huge impact in your bathroom, then consider upgrading your old bathroom vanity mirror in toa modern mirror options! If you have a long wall for bathroom vanity mirror, then you can go for a pair of large mirrors, that will steal the light and the show in your bathroom! In bedroom, a mirror can be functional while it can also serve as a work of art. The mirror itself is large enough to serve the purpose of a space to review look for the day! Also Read: How to Create a Dressing Room? 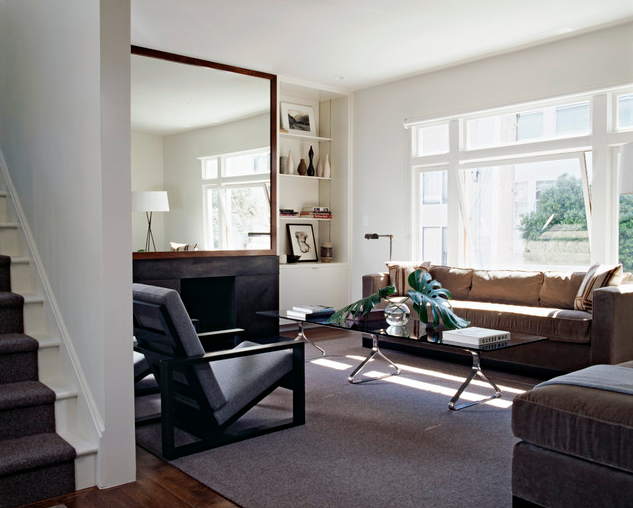 Living rooms, lounges and dining rooms are a great space for installing a super large mirror. As large mirrors also serve as art pieces, and open up the space with a huge reflection of the room. They also create more light in the space and make rooms look bigger! If you have a full-size window at your home, especially in the living area, place a large mirror on a wall right across your window! This will not only double-up the room space but will also make it look brighter, especially with a natural light falling directly on to the mirror! You can transform your complete wall by using mirror tiles! This can be further enhanced by adding a mix of wood or marble with mirror. It will definitely makes your room more spacious and luxurious! 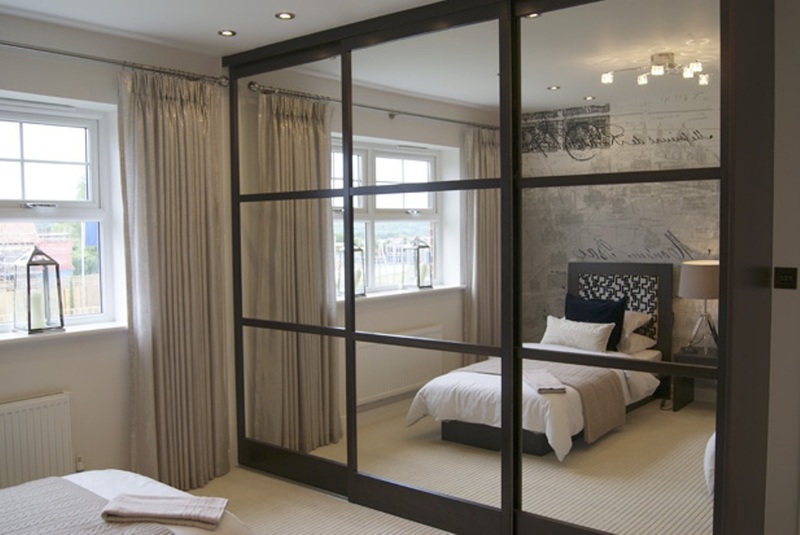 Having a mirror on wardrobe panels is one of the best mirror decor ideas, as it looks like its own freestanding dressing room! If the house has a narrow hallway or a passage, then we can add a large mirror in order to open up the area! In an apartment with the limited privacy; when you have no choice but to cover a bathroom or bedroom window to block out direct views from your neighbouring apartment. You can use large mirrors that reflect the natural light coming in through the shutters brightens-up your room and make it fresh and cheerful! Decorative mirrors can be used as artwork on a gallery wall by hanging it featuring different shapes and size of frames randomly! Mirror art can be done with various creative designs depending on the materials & theme for your home decor! Also Read: Fantastic Tips for Hanging Art Correctly on your Wall! 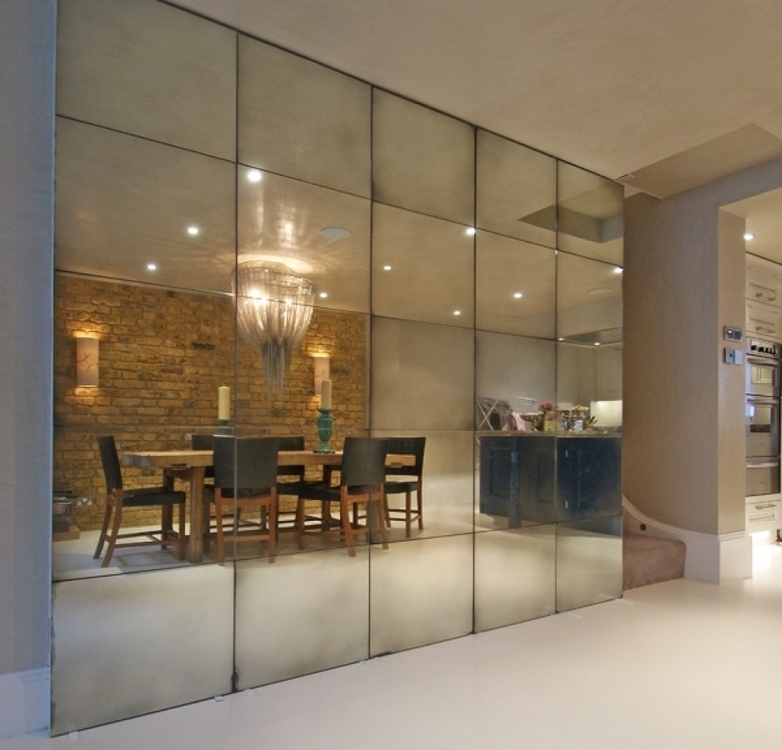 Walls and floors are the perfect places for functional and decorative mirrors. But an unexpected modern mirror as a design feature opens-up a whole new realm of possibilities! 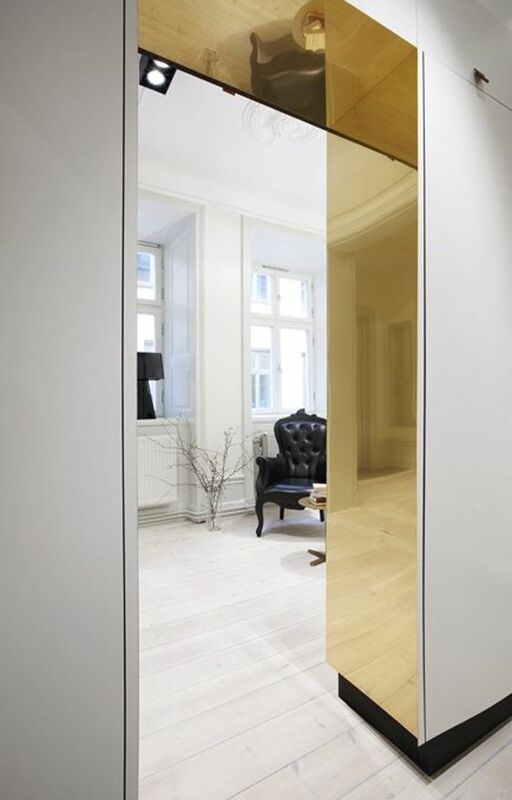 In this image, a doorway mirror in a metallic sheen gives the space a new layer of character! Repurpose your old door into an eye-catching decorative mirror! Paint the door in a colour that complements your decorating scheme, and to make it more functional, attach vintage hooks to hang bags, coats or hats over it! You can even use this door with mirror hinged to conceal a recessed storage cabinet to enhance your home interior! Wall between the kitchen shelf and cabinets is called backsplash! Tiles are mostly used to cover the backsplash. By adding a mirror instead of tiles can do wonders! It will gives your kitchen a different look, but make sure that you clean this area as it will be directly prone to stains! Extra care is required when you use the mirror in a kitchen backsplash. Though sometimes due to the heat of flame the mirror gets also cracked. Cleanliness is also the essential criteria for this option! Using mirrors on your stairs is likely not for everyone’s home, but it’s hard to deny that as a standalone mirror decor idea, it is pretty cool! Using mirrored stairs may create the illusion, not suitable for family living with aging parents. Therefore extra care is required to climb-up! Using massive modern mirror and ornamentally framed works well for your home decor. Not only it give you all full large mirror space, but also act as a statement piece of your home decor! Though it also opens-up the room beautifully by giving the optical illusion of more space! 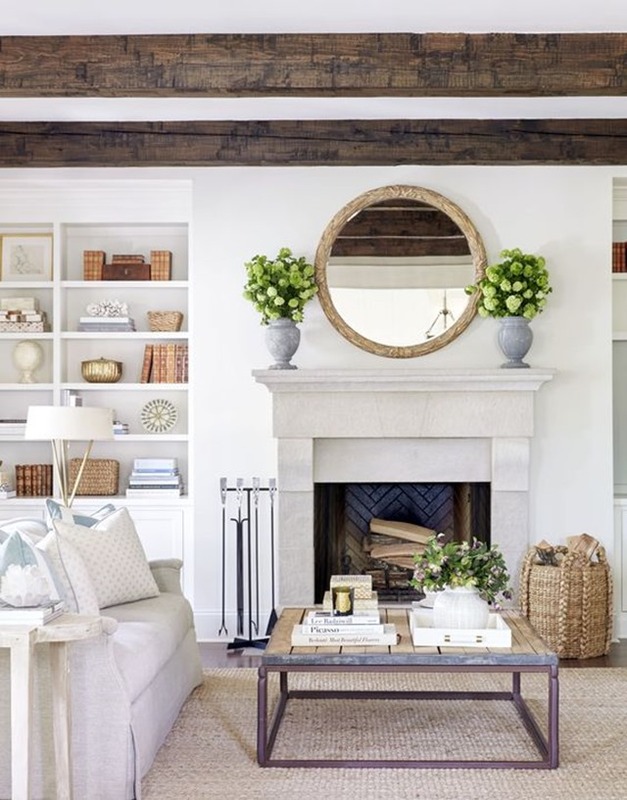 Fireplace mantel is one of the most common areas in the house to place a decorative mirror. You can add a vintage mirror frame or cover the whole wall with modern mirror tiles. To enhance its look add some home decor items, such as a flower vase, candle stand or a showpiece, to make it look even brighter! We hope that this creative mirror decor ideas will inspire you for better home interiors! We firmly believed that room automatically look sophisticated, if it has a great mirror inside! Share your home interior mirrored photos & experiences! Tips for Using Rugs to Decorate Your Room!